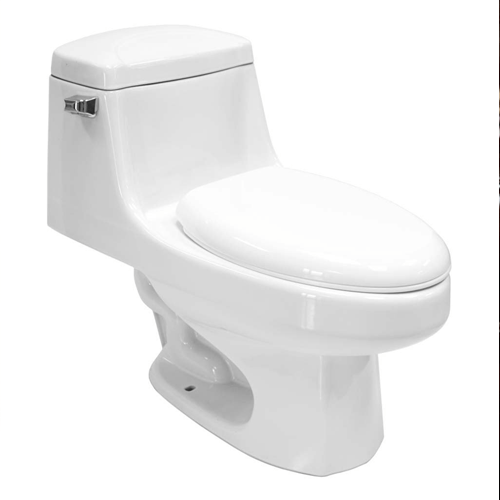 Robin 1.6 Gallon, One Piece Dual-Flushing System Toilet in White with a modernly styled Elongated Toilet Bowl renders a revolutionary High-Efficiency, low consumption (6 LPF) technology that bears a Water Sense approved construction designed to use less water. The A-grade vitreous ceramic architecture ensures to withstand any harmful or acerbic fluids, scrapes, or tarnish. Our complete package features a siphon flushing action and 12 in rough in as a standard for easy installation. Eco toilet 4 features premium ceramic construction and low water consumption fully glazed dual-flush system with only 0.9/1.58 gallons per flush. Effective flushing is guaranteed with siphon flushing action. High-quality soft-close toilet seat provides maximum comfort and hygiene. Every Eco toilet is Water Sense certified and meets EPA criteria. Installation of the Rohl is fast and hassle free with a standard 12 inches rough-in. The toilet comes in one box with included toilet seat, wax ring, floor bolts and two bolt caps.